CLEVELAND – In a first-of-its-kind in-depth look at millennials in Northeast Ohio, a Cleveland Foundation-commissioned study by The Center for Population Dynamics at Cleveland State University reveals Cleveland is eighth in the nation in the growth rate of college-educated millennial residents aged 25 to 34. And Cleveland’s millennial residents – those born between 1982 and 2000 – are leading a rapid ‘fifth migration,’ the term for the re-urbanization of metro areas nationally, here in Cleveland. 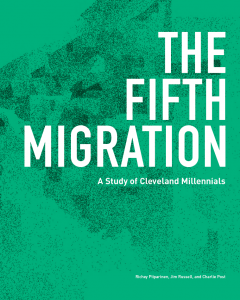 The study, “The Fifth Migration: A Study of Cleveland Millennials,” reveals that while Cleveland has experienced a millennial migration since 2008, it was during the growth experienced from 2011 to 2013 for which Cleveland tied for eighth in the nation (along with Miami and Seattle) in the percent increase of college-educated millennials. The study also shows Cleveland ranked eighth nationally in the concentration of highly-educated millennials in the workforce (those with a graduate degree). Beyond this so-called ‘brain gain,’ the statistics show a higher concentration of millennial residents overall, regardless of education. In 2013, 24 percent of Greater Cleveland’s population was comprised of millennials (ages 18-34), up from 20 percent in 2006. The study also showcases the dramatic gain of millennials in Downtown Cleveland – a 76 percent increase in 25- to 34-year-old residents from 2000 to 2012. As of 2012, 63 percent of Downtown Cleveland residents were millennials – compared to 20 percent in the Greater Cleveland metro area and 23 percent of the overall U.S. population. Additionally, the study illustrates the density of millennials in the inner-ring suburb of Lakewood, whose millennial population makes up 31 percent of the city’s population, compared to 23 percent nationally. Prior to 2007, the numbers show Cleveland was actually experiencing ‘brain drain,’ with college-educated millennials leaving the area. The launch of Cleveland’s millennial migration coincides with the start of the Great Recession (2008-2010) and continued through the post-recession (2011-2013). The study cites that the tremendous growth Cleveland and other ‘rustbelt’ cities, such as Detroit and Pittsburgh, have enjoyed during this period can be attributed to numerous factors, including the cost of living. To reinforce that point, in examining the net migration into Cleveland, the study reveals Cuyahoga County drew the most migrants from Kings County, New York (including Brooklyn). The average millennial income in Kings County was $40,440 in 2013, versus $34,597 in Cuyahoga County during the same time period, but when adjusted for cost of living, the New York salary is actually $5,590 less. And the median rent in Kings County is $2,583 versus $1,088 locally. Despite the recent influx of millennials to the area, Cleveland remains one of the cities with the lowest concentration of millennials – 23.7 percent compared to 28 to 29 percent in top cities such as Austin, San Diego, Virginia Beach and Los Angeles. Comparatively, Cleveland has the second highest concentration of baby boomers (born 1946 to 1964) and the fourth highest concentration of the Silent Generation (born 1927 to 1945), due to historic settlement patterns in the area tied to manufacturing. Also, Cleveland’s millennials have less ethnic and racial diversity than millennials nationally. Nearly 66 percent of Clevelanders aged 15 to 34 are white, followed by 23 percent black, 7 percent Hispanic and 3 percent Asian. Nationally, 57 percent of millennials are white, 21 percent Hispanic, 14 percent black and 5 percent Asian. Foreign-born millennials make up just 6 percent of local millennials. There is also a reverse migration happening where non-college educated millennials who grew up in Cleveland are migrating out of the city, while young adults raised in the suburbs are choosing to move to the city. The analysis was completed using data from various Census databases, including the Decennial Census, the American Community Survey, and the Current Population Survey. Cost of living data was compiled using the Bureau of Economic Analysis. The graphic design and data visualization for this study were done by the Portland firm Paste in Place.